Contemporary French-influenced cuisine served in an elegant space designed by Adam Tihany. 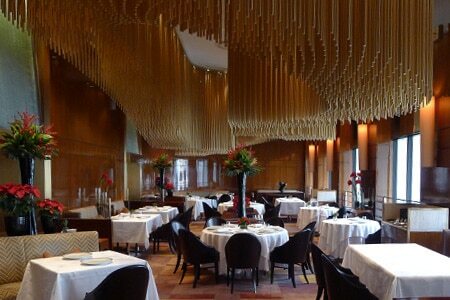 : Amber is the signature restaurant of The Landmark Mandarin Oriental, Hong Kong hotel. The centerpiece of the Macassar ebony wood-filled dining room created by renowned interior designer Adam Tihany is a chandelier of 4,320 suspended bronze rods with their undulating patterns casting a warm metallic glow over the double height space. Holland-born culinary director Richard Ekkebus trained in France under such talents as Guy Savoy, Alain Passard and Pierre Gagnaire and here he crafts modern, seasonal French-influenced cuisine with ingredients flown in daily, from the Tokyo fish market to those from Tasmania to Brittany. Head sommelier John Chan sets his sights just as globally with sips from fine old-world vineyards as well as what he calls 'wines of discovery' from Portugal and South America. Palates are pampered even before the ordered courses arrive, with amuse-bouches such as the playfully presented candied foie gras resembling a lollipop, and a fried pork and pickled vegetable croquette thoughtfully balanced by a dollop of tart, creamy yogurt topped with balsamic tapioca pearls and olive oil gelée. Mains might include sweet and briny sea urchin in lobster jelly with rich cauliflower, salty caviar and a seaweed waffle, or the thick oven-roasted Kagoshima Wagyu beef with puréed caramelized shallots, crisp lettuce hearts and a hint of lime cream. The artful desserts should not be missed, and the same goes for the petits fours served on cascading metal plates.